Man or woman, young or old, inexperienced or expert, it doesn't matter who you are or where you're from. You're just as important to the group as everyone else. That's one of the points Rick Cormier conveys about his group, the Different Drummers Drum Circle, based in Yarmouth. It's a place for interested skin beaters of all ability levels to come and share their love of rhythm and music. Other instruments such as flutes or the human voice, are also welcome to add flavor to the sounds being created. For the past year and a half the circle has met in the First Universalist Church on Main Street and its ranks have grown rapidly. interested in joining a drum circle there. "Before long I was being called the unofficial leader of it," he said. "Over the years, it grew in leaps and bounds." In fact, Cormier noted, they were said to be the second most frequented drum circle in the state. This was a freestyle drum circle as is the current Maine group. Whereas a facilitated format would place him in the center of the group, telling people which beats to play and when to begin and end, in freestyle he sits with everyone else, allowing anyone to begin a beat, with others jumping in when they find a beat to add. of music we're creating is the focus." And where does a certain piece of music end, once the group is moving together for about five to fifteen minutes? "The longer people have been playing together, the tighter the pieces become and the tighter they end," he noted. "People sort of know 'this would be a great beat to end on.'" Oftentimes the ending will be followed by laughter, sometimes because one person played past the final beat, but more frequently because the group is amazed by how well the piece evolved from an impromptu beat to a work of rhythmic art. 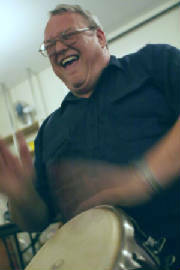 Among his 50 to 60 hand drums are djembes and djun djuns from Africa, doumbeks from the Middle East, congas and bongos and Native American drums. "People bring whatever drums they have," Cormier said, noting that he always carries about seven or eight extras, which remain in his car all the time. "My back seat and trunk are full of drums." he chuckled. "We're very open to novices," added Cormier, quoting one of his favorite slogans: "A drummer is a novice who keeps showing up." "The more they drum, the more their skill level comes up," he said. Cormier says he discourages beginners from buying their first drum right away, recommending that they first sample many to determine which type best fits them. The format remains informal, as evidenced by Cormier's saying: "Come when you can and leave when you must." Between musical rounds, group members mingle and chat, but "they don't go into politics or religion," he said. "People are taking a break from that stuff." in my ability to create rhythms and to keep those rhythms going." "The people are great," she added. other people," the Yarmouth woman said. "What's wonderful is that someone starts drumming and you find a way to be in there." noted Rudy Gabrielson, a keyboardist who has been with the group from the beginning and performs with Cormier in a band called Dad's Night Out. "Rick is just amazing," he added. "I call him the Johnny Appleseed of drumming." "There's a merging of individual expression and being part of a community," Gabrielson said. "By the time you leave you're feeling pretty great." "It's something that's been happening for thousands of years," he added. "The connection to that feeling is really good as well." life," he noted. 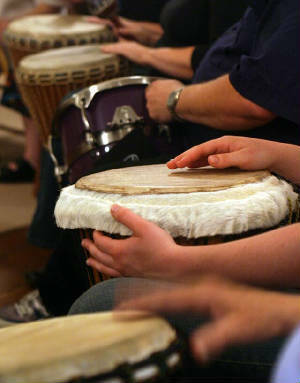 "I'm a psychotherapist for a living and drum circles are my therapy. They're very therapeutic. I wanted to either find or start one." Joining the Unitarian church, he offered a workshop similar to one he had devised in Massachusetts, hoping those who attended would be interested in continuing the activity in regular sessions. Comparing this group to the one in Massachusetts, Cormier noted, "People up here tend to be more receptive to it partly because the education level is higher and people in Maine tend to be open to alternative therapies and practices. More couples and families are involved with it. People are very family oriented in southern Maine." from the Aboriginal didgeridoo or the South American berimbau to the mandolin. Cormier also continues to teach Intro to Drum Circles workshops a few times a year. His second four-class seminar through Yarmouth Community Services will begin Wednesday, Sept. 29. "My aim is to just get people comfortable and confident drumming," he said. 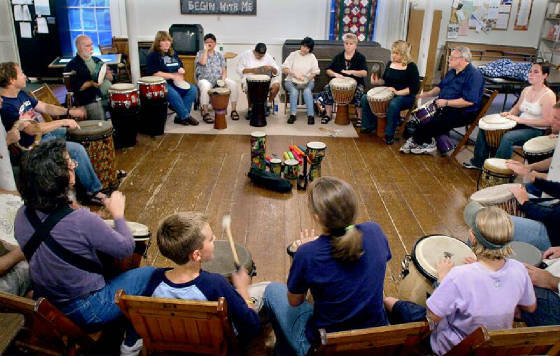 And Cormier always encourages those who enjoy the workshop to come and drum at the church with other enthusiastic rhythm makers and do it for free. "This is obviously something I have a passion for," he noted. "I love the work I do in these drum circles. I really do." Drum Circles: In the News 1 "Beatniks"
Drum Circles: In the News 2 "Big Bang Theory"